Statistical quality control can be defined as a process which uses statistical methods and approaches in maintaining and monitoring product and service quality. One of the most popular statistical methods used in this process is called acceptance sampling which is extremely useful if you need to make a decision to either reject or accept a group of items or parts based on the sample quality. It should also be noted that the statistical quality control process is used in analyzing problems associated to quality and solving them. All the tools that are now used in the process are also useful in the effective evaluation of service and product quality. These tools include descriptive statistics which is primarily used in describing quality relationships and characteristics, statistical process control which works by scrutinizing random output sample from a process to detect its characteristic and acceptance sampling which is extremely useful in performing the batch sampling process through inspection. The implementation of the statistical quality control process actually offers numerous benefits to your organization. One of these is that it helps in significantly reducing inspection costs since the process only requires inspecting a fraction of an output. It also offers greater efficiency and can be easily applied. In fact, even if you do not have a strong mathematical background or extensive training in the field, you can still expect to execute the process effectively. Other advantages of this process include promoting early detection of errors and problems and strictly adhering to the quality specifications and requirements of your organization. The statistical quality control certification program which you can now access at Brainmeasures is the best online certification course for you if you have longed to master all the techniques and concepts associated to performing the statistical quality control process. This statistical quality control course from Brainmeasures is highly beneficial because it is comprehensive enough that it covers all the aspects that you want to learn about the process. Enrolling in this certification course allows you to undergo an impressive statistical quality control training which works effectively in strengthening your knowledge especially about the most common terms and concepts used for the process, major principles followed by experts in implementing it, its most remarkable benefits and the most popular statistical quality control tools and methodologies available at present. By earning your statistical quality control certificate, you will have an easier time proving to the public that your skills and expertise in this field are highly competitive. 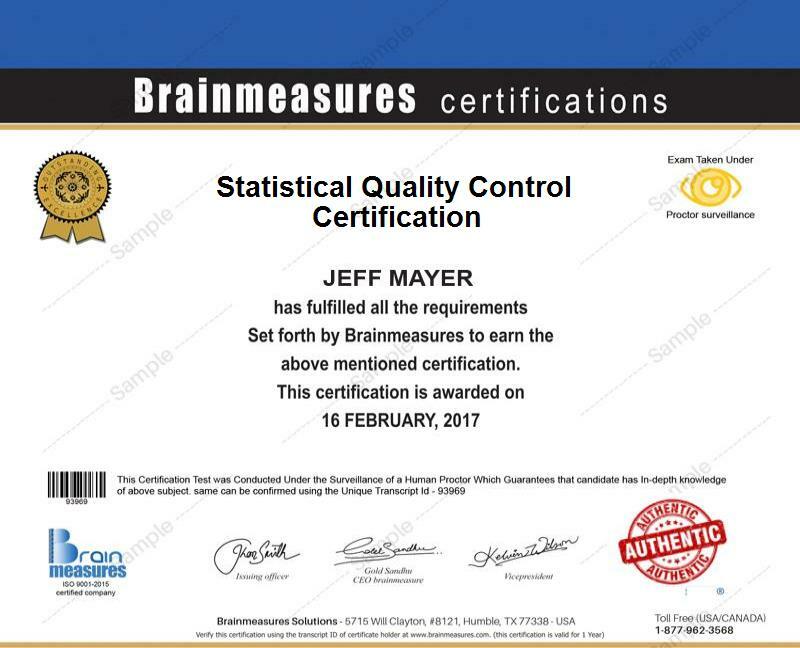 Just like the hundreds of online certification courses offered by Brainmeasures, its statistical quality control certification program is also proven to be highly beneficial. You can expect it to work more effectively and suitably for quality assurance managers, quality control professionals, management representatives, engineers, statisticians and any other individuals and professionals who are responsible in using statistical quality control tools and methods in monitoring, evaluating and improving process quality. Earning a statistical quality control certification can also do a lot of good when it comes to increasing the level of your salary. With the help of your statistical quality control certification, you can easily grab the position of a statistical quality control analyst which often rewards you with a salary of around $57,000 to $87,000 per year. Working as a statistical quality control engineer is also very rewarding because it allows you to generate an average annual salary of $94,000.